I am not backward about speaking about poor service or products. To counter this, I try to give credit where credit is due. I've had great service this week from Tasmania. 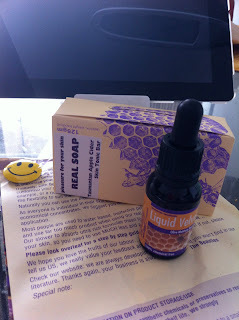 I've bought goods several times over a few years from Beauty and the Bees. I gave some of their products to two DILs and to my sister at Christmas. They were very well received. One DIL said she loved their goods but usually could not afford them. It was her birthday last Wednesday. On Monday, very late in the afternoon, more like early evening, I placed an order for some apple cider soap and some moisturising serum for her. Note: late Monday. Late on Tuesday evening, about 11 pm, I checked the Star Track parcel tracking page. All it said was "in transit." ON Wednesday morning, I was just typing in their URL to see when it would be delivered and my intercom buzzer went. My order was in my hands at 9:00 am. Well done. I was amazed. It was very well packed in a neat little box marked as fragile. Lots of bubble wrap and soft packing to fill the box. As I opened the box, there was a sharp but delicious smell from the soap and I found a sample shampoo bar and a sample soap as well as my order. Can you guess what this is? Hint, hint. It's not butter. It tastes wonderful. I ordered some honey from Beauty and the Bee. Leatherwood honey. I really like it but the last lot I bought was very strong, almost too strong for me. Tasmania is the only place which produces leatherwood honey. This is a bar of naturally candied leatherwood honey. 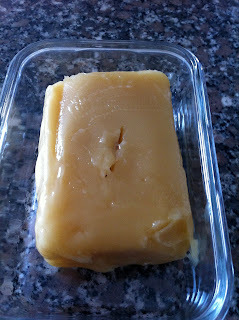 It was packed like a big piece of butter, very well wrapped in wax paper and with other wrappings on the top. It's amazing. Super nice. 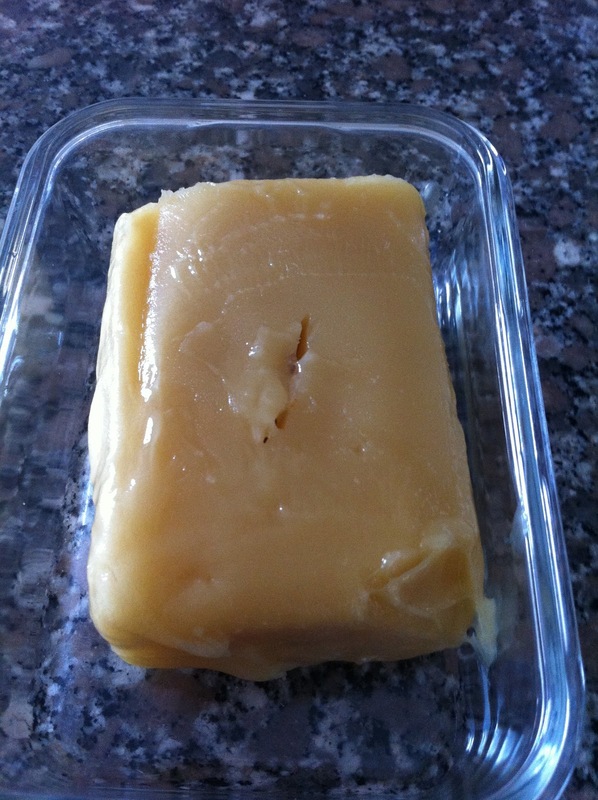 Very smooth and creamy in texture. I love it. It wasn't cheap but as a smaller size jar than this from the supermarket has lasted me two years, then this as a treat will be a cheap treat. I do have a lid for this container. Postage used to be by weight and moisturisers etc are heavy. Their products are now sent by Star Track courier which so far has been much cheaper than mail. I can't fault their service either. 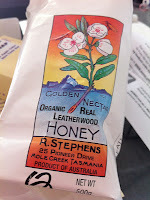 We are made of sterner stuff here and Tasmanians love their Leatherwood honey. Straight from the jar!! The Stephens are wonderful honey people. I also have some beautiful thick creamy Christmas Honey from Perth, just down the way a bit. What a fabulous thing. 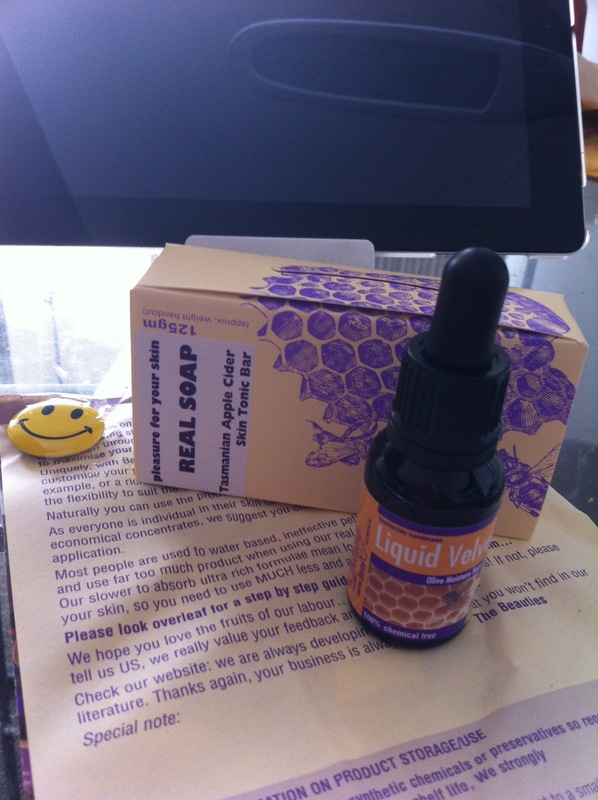 Enjoy your honey and how wonderful to get such great service. The Beauty and the Bees people have restocked their spots up here, but I received 4 blocks of the shampoo for Christmas: they'll last me a year!! I love honey and have it on my porridge most days. I'm fascinated by your leatherwood honey and would love to try it. Might just have to make the trip! Thanks for your blog btw, I do enjoy reading it. Hope you and yours are well. I have had the leather wood honey in the past it very strong flavour. Its sad that the wool shop in Katoomba closing her husband not well he has had or going to have major heart surgery and she retiring but she hasn't got a set date when the shop is closing. She just sell things and not restocking. There is a new wool shop in Blackheath but it has more upmarket yarns it lovely but its only open 3 days Fri to Sunday? We moved to the Blue Mountains because we couldnt afford to live in Sydney any more the rent was too high. We bought up here a year ago. Our repayments up here are cheaper than renting in Sydney. I haven't had leatherwood honey in years! It's always great when we receive good service, isn't it?